China is pushing for deeper economic integration of the ASEAN, urging that territorial disputes in the region should not overshadow economic ties with Beijing. China and Association of Southeast Asian Nations (ASEAN) members agreed in Brunei on Wednesday to scale up bilateral trade to $1 trillion by 2020 from about $400 billion in 2012. The 16th China-ASEAN leaders’ meeting was held in the Bruneian capital of Bandar Seri Begawan. 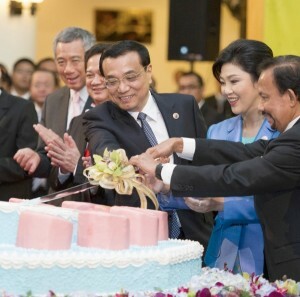 Chinese Premier Li Keqiang, who arrived here earlier in the day, attended the summit with leaders of the ASEAN members. China and ASEAN will also expand bilateral investment to $150 billion in the next eight years, said a joint statement. According to official data, China-ASEAN mutual investment has totaled over $100 billion dollars by the end of 2012. The two sides will also begin discussions on upgrading an already existing Free Trade Agreement (FTA). The Chinese premier also called for concerted efforts to set up an Asian infrastructure investment bank, proposed earlier by President Xi Jinping. On the territorial disputes of the South China Sea that has strained relationships between China and a few ASEAN nations, Li proposed the signing of a “friendship treaty”. “A peaceful South China Sea is a blessing for all. We need to work together to make the South China Sea a sea of peace, friendship and cooperation,” Li said. China has recently agreed to discuss a code of conduct with ASEAN and has also reiterated that Beijing is ready to uphold freedom of navigation in the disputed waters. US Secretary of State John Kerry is expected to press China to discuss the issue at the East Asia Summit.